Tandem reminded me so much of the TV Show Fringe. If you’ve never watched the show I encourage you to do so, it’s fun, kind of creepy, and it’s got Joshua Jackson so you’ve got some eye candy. In Tandem you have many of the same elements it’s fun, there is creepy science, and of course a swoony love interest. The problem is while I enjoyed Tandem Fringe did everything this novel did, only better. Sasha is forced through the Tandem to take the place of the missing princess Julianna in Aurora. Aurora was created after the last common event between Earth and Aurora occurred and George Washington was killed in battle rather then becoming president. Why then are Earth and Aurora not both named Earth if that was the last common event that caused the split? I have no idea, but I’m pretty sure Earth was named long before the revolutionary war. Sasha was an alright heroine. I really liked her at certain points and then she would cry and I would like her a little bit less. Then she would do something awesome and I would like her more, then she would obsess over her love interest and I would like her a little less. Needless to say there was a lot of back and forth between Sasha and I. In the synopsis there is the hint of a possible love triangle and I want to allay your fears. There is what could be viewed as a love triangle but for once Sasha really knows what she wants so there is really only one love interest. The world building in Tandem was done very well. Creating an entirely new world is very difficult and having people cross back and forth you have to create two worlds. Jarzab did a marvelous job creating Aurora and describing Chicago. The world building was my favorite part of the story. My least favorite part was the science and large sections of science-y descriptions. Like in Fringe there was also a crazy genius older scientist to explain everything. Also like Fringe, you have to completely suspend reality to believe the whole crossing through the tandem thing. Overall, Tandem was a good read. There was nothing wrong with the mechanics of the story. The writing was good and the story was interesting. But my on again off again relationship with the heroine and the many similarities to Fringe stopped me from loving this story. Given the opportunity I will read the sequel, there are a lot of questions left hanging after Tandem finishes and I have high hopes that Sasha will do more growing in the next novel. 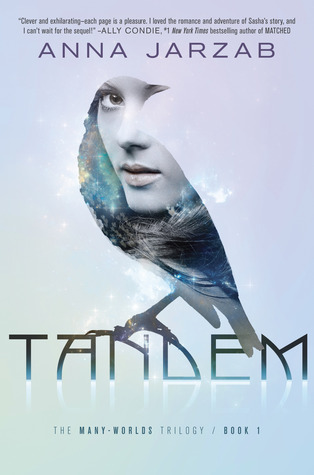 Thank you Netgalley and Delacorte Books for Young Readers for allowing me to read an advanced readers copy of Tandem. Great review. I am reading this book right now and I am enjoying it. I agree so much about Sasha... i like her at times then others not so much. I LOVE Fringe. I was so upset when it ended and I thought about not seeing Joshua Jackson's face everything (I had a Dawson's Creek marathon to ease my pain). Hopefully the heroine will be a lot more likeable in the next book! Hmm, I don't think I liked Fringe all that much. I watched half the first season and gave up, so I'm not sure I would like this one. I can see how the science would bog down the book. I have to admit though, I'm just not sure if alternate universes is my thing yet. I have yet to read one because they just don't call out to me! Maybe I should at least give one a shot... Great review, Emily! I loved Fringe. Even though you had a few quibbles, I'm still really intrigued!